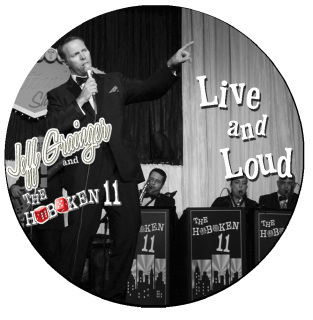 The premier Sinatra Tribute artist debuts his first Live album with The Hoboken 11 band. Complete with 16 of Sinatra's best performed by leading Sinatra Tribute artist Jeff Grainger - see if you can tell the difference!! The vocals are deep, rich and completely addictive. I could listen to them all day. the voice is so strong, heartfelt and attractive. "We recently hired Jeff to play at our wedding in the Florida Keys and from the minute we started talking, the experience was perfect. We'd waited until 2 weeks before the wedding to find entertainment as our original band fell through. Jeff understood and was very quick to communicate and answer questions, and as opposed to many Miami entertainers we looked at, he was reasonably priced. He ended up being the best choice for our wedding. He sounds EXACTLY like Frank Sinatra! We were going for an upscale, adult beach party and he fit right in. His band is talented and professional, and each of our guests commented on how well his music fit into our magical evening. He arrived on-time, and played everything we asked, and allowed us to pick our own playlist for breaks. It was a delightful experience, and our guests are still raving that ours was the best wedding they have attended in years! Thank you for being awesome, Miami Crooner!"